As a society, we’re motivated to do more when it comes to the disposal of our waste. We want to become that nation that’s been pictured in movies: the sun is shining, we’re dealing with zero waste, we’re driving hover cars that run off the sun, and we’re enjoying the fruits of these efforts. But this change will only come when we increase recycling levels, instead of just talking about this change to our world. Being able to make this major change comes with effort, and this effort is entirely dependent upon the three major pillars of recycling. These pillars are: policy changes, habits, and recycling systems. Between 80 and 90 percent of the waste that we create in this place we call home can be recycled—so it’s time to focus on this chunk of garbage and make better use of it. What can you do on your part to push this effort further than we thought possible? In the history of our nation, we have never once had a rule that applied to all waste and the reduction of this product. We leave this processing decision up to state and local governments, resulting in the fact that less than 20 percent of plastic is recycled properly in America. Imagine a utopia where we work together. From country to country we have the same rules, or at least rules that cohesively work together to change the face of our planet. If we don’t follow these regulations for recycling, we’re punished or have to pay a fine. For once, our individual efforts are backed up and we work toward the idea of a clean planet. Finally we are kept on track with recycling rules. Unfortunately, this idea of a utopia is far from the reality. We have bins that we’re supposed to organize our recycling into. But we haven’t been held to a standard until recently, which requires us to keep our recycling to China clean. So in the long run, what rules do we have to keep plastic waste from spreading around this beautiful world like a virus? This isn’t a waste management problem that is unique to the United States; in fact, this is an issue that spreads across our world. India set regulations at the kind of packaging they wanted, but they don’t have the composting ability to uphold those changes. Because we don’t have lobbying for recycling, politicians don’t typically feel obligated to do much. This is the wrong attitude—if people stopped asking for clean water because they thought they were safe, would the government stop providing it? Take some time out of your day to write to your politicians. Encourage them to increase the levels of recycling through their waste management efforts. We have the power to halt this crisis. We mention this all the time, but the most common excuse for not recycling is that people don’t have time for it. This isn’t a malicious goal for someone to watch the world burn. It’s a simple reality that this idea of “go green” can feel like a burden. We don’t blame someone for not making it to the gym, or simply not eating healthy enough. This is because we have the understanding that their habits don’t necessarily match up with their roles just yet. When it comes to recycling, there are restaurants that want to reduce their waste. We have people in the community who are ready to improve their disposal habits. It’s on us not only to improve our recycling habits, but to also spread the knowledge to the people we care about most. There are minor changes that can be made on a daily basis, which would shoot our recycling levels way up. The mentality to maintain when trying to improve our recycling system is, “We are one earth with one problem.” It’s up to us to keep this planet in a safe and happy place. We can make small, informed choices that will better our community in the long run. When you go to work, don’t depend on the plastic bottles of water; instead, bring a reusable bottle that you can enjoy throughout the day. When you go to the store, don’t use the plastic bags for vegetables; you should bring mesh bags that work just as well, and won’t end up in a landfill. Though encouraging these habits to better our recycling habits can seem like a chore, it’s really as simple as planning ahead. We’re living with a broken system. We’ve spent so much of our recycling energy into exporting this waste to China. Now that they’ve increased their recycling restrictions, we’re left wondering what to do next. If we had the proper waste management systems in place, this major change would only appear as a minor hiccup. 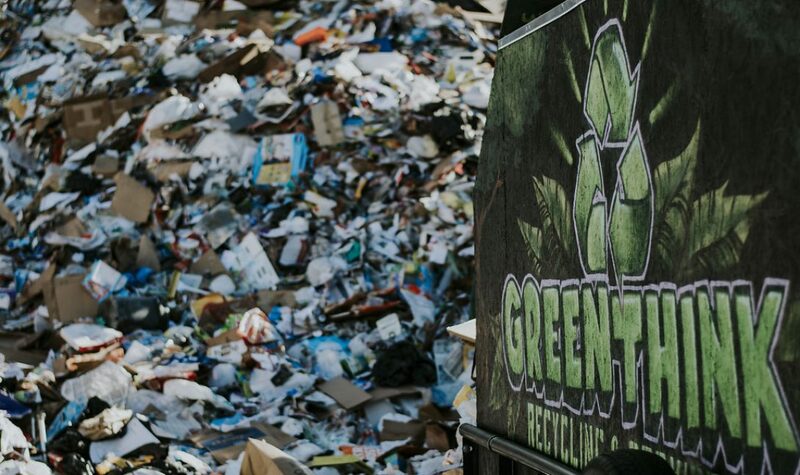 Because it has been entirely up to state and local governments to develop recycling programs, with no federal oversight, we’ve fallen into a dangerous pattern. In the western states, we rely heavily on landfills, which isn’t a problem due to our wide-open spaces. But when you look back east at places like Boston, Massachusetts, there is no place for this waste to go. Now, it’s on us to increase the knowledge that will better our recycling rates. This means that sorting has jumped up into a first place priority, as far as “importance to recycling” goes. At Green Think, we want to be in line with this change. We know that you don’t have the extra time to organize your trash while you’ve got a home to take care of, kids to pick up, and a family to feed. We want to do the sorting for you. Our new sorting program makes your life easier by clearing out trash that would normally not be accepted into China, reducing the amount of waste management contamination, and reducing your footprint on this planet. Do your part to make sure that our beautiful blue and green planet last for millions of years to come. The days are growing longer and your kids are back home 24/7. You’re going crazy looking for things to keep them busy and out of your hair. You have already tasked them with pulling all the weeds in the yard, sorting through your recycling and running laps outside. It’s time to think outside of the box, or rather, outside of the city. It’s time to take your family camping. You’re going out into the wilderness and getting in touch once more with your wild roots—not to mention, hopefully running out your children’s energy. However, because you’re only human, you’re going to run into one major issue: how to handle your waste. Modern technologies have made it so that we don’t have to entirely live off the land, even when we choose to think green. But this doesn’t mean that your family vacation should be any less eco-friendly. Here at Green Think Recycling, we want to remind you to make your minimal impact on the world. Do what it takes to camp sustainably. You can still enjoy your summer while thinking of your impact on things much larger than you. You’ve made it a priority to recycle in your home. If you’ve gone the extra mile, you’ve got a bin for plastics, paper and clean cardboard, and you’ve also got one for glass recycling. If you keep these bins as only a focus in your home, you’re doing your family a disservice because they aren’t keeping recycling in their minds on a daily basis. Utah is known for the gorgeous backdrop that the mountains create. We’ve got a beautiful valley that leaves most tourists wondering how to get back here. Every single person in this state needs to hold onto the recycling mentality, regardless of what they’re doing. Why teach your children to recycle outside of the home? It’s something free that serves a greater purpose. You teach your children to be charitable and give a smile to those who are having a hard day—why not apply the same principle to the way we treat the planet? Recycling while you’re camping comes way before you even make your trip. Whether it’s a single overnight trip or a weeklong backpacking excursion, it all starts with the equipment. When you choose to think green, you’re choosing to think smart about the items you use on a daily basis. When you’re keeping that think green mentality with you, it means you need to pick high quality, long lasting equipment. One of the best things you can do for the beautiful Utah wild lands is to stay away from products that have BPA and instead use those made from recycled materials. This is absolutely vital when it comes to your tent. This handy shelter is your home for the trip, but you need to make the extra effort when it comes to the wild home you’re in. Be sure that the tent does not have any toxic dyes, especially if there’s rain predicted in your forecast. This way, the environment will be safe—and you will be able to recycle this product when you’re done with it. As if that weren’t enough, the world of innovation never stops. When you’re preparing your family for their long trip out, recycling shouldn’t be the only thing on your mind. You need to decide what kind of campers you’re going to be: the rough it type or the glamping clan? Solar tents are the newest form of using technology, but doing it well. Solar fabric catches energy that emanates from the sun. This way, you can enjoy all of your modern conveniences in the beauty of nature without the need for generators or toxic gas. And finally, you could always bring plenty of plastic bottles, cups, plates and paper napkins. I mean, you’ll be recycling these items as soon as you get home. But the think green mentality means you need to consider the impact that these items have from beginning to end. Consider refillable water bottles and camping dinnerware. This reduces the necessity for the mass production of waste that would just end up in a landfill. Just be sure to bring biodegradable soap that won’t harm the planet. Break free of your disposal mindset, and welcome to the land of recycling. This isn’t the kind of “starts at home” that we talked about before. Your children know the importance of recycling already. This kind of preparing is to reduce the amount of packing when you’re still within reach of your recycling bins. For instance, you want your kids to have an easy breakfast after a night under the stars. The simple solution is a bowl of cereal. However, we’ve all seen the unnecessary packaging that this product comes in—half the box is filled with air, for goodness sake. Do yourself a favor and move the cereal into small, compact, reusable Tupperware before you even set out. This way, you won’t have to focus much brainpower on recycling and can instead put it toward beating your family at a game of Monopoly. When you’re doing the grocery shopping for this trip, remember to think green. It can be tempting to buy a box of fun sized chip bags. This way everyone gets their favorite flavor and you don’t have to deal with arguments. However, you’re increasing your waste with something that doesn’t even belong in the recycling bin. Buy a few large bags, put them in tough packaging instead and you’ll find that you don’t have to deal with chips getting crunched—another think green win. Finally, reduce your waste by getting your food ready while you’re still at home. You want your kids to eat well, and this means sneaking vegetables in to their hobo dinners. But when you bring packages of vegetables up with you, you’re also bringing unnecessary bags that would be better off at home in your recycling bin. Chop up these veggies in your kitchen, move your meat into reusable containers, and you’ll find that you’ve reduced your waste and tricked your kids because they never saw the vegetables coming. You need to take the steps toward recycling smart by simply recycling less. Before you start your journey into the mountains, you have now set yourself up for unlimited success. By now you’ve probably realized the theme we have going. It’s all about preparation. When you’ve got a think green game plan, and you’ve shared that with your family, you’re ready to take on anything. While you set up camp, be sure you also choose a place for the waste and recycling bins to go. Do it the sustainable way by bringing a reusable cloth bag for your trash. You’re going to bring it home with you anyway, so do it in style. Of course, keep in mind that your trash needs to move to a safe place during the night, so as to keep animals away from your family’s home away from home. Think green doesn’t have to only do with the way you manage your waste. You also need to think of the way you’re treating the environment. We’re so used to navigating the concrete jungle that we don’t recognize the way we stomp around. Wear soft-soled shoes and remember to tread lightly. By not damaging the plants that came before you, you’re not only in the think green mindset, but you’re also leaving nature wild and untamed—the way that it should be. There is nothing better after a long day of setting up camp and playing in the lake than a nice, big campfire. No matter how long your family chooses to stay, your recycling is going to play a major role here. It’s your chance to educate your family on what can be put in the recycling bin, and what would be better off being reused while out here in the heart of nature. This means that you need to teach your family about what can be burned. There are some recycling items that are not safe for the planet when burned. This includes things made of plastic. On the other hand, if you’ve got plenty of cardboard, paper, match sticks, toothpicks and dead wood, you’ve got the perfect heart of a fire. This means you need to bring an extra bin, aside from the waste and recycling bins. You need a burn-ables bin. This is the fun part where you’ve turned your recycling into upcycling. As any responsible family, you need to make sure that it’s allowed before you start any fires. If you’re living in a dry part of the state, or if you’re out in the hottest, driest part of the summer, save these burn-ables for another time. After your stay, give the campsite feedback on the recycling process. Did you find it easy to maintain your think green mindset? What kind of things could they do to make this easier to maintain? By doing your part, you’ve made the Utah wild lands a better place, and hopefully simultaneously ran your children’s energy out for the next couple of weeks (a parent can dream, right? ).